CPD’s first session brought together labor leaders and national immigrant rights groups to strategize about organizing immigrant workers. The session explored the extraordinary potential that immigration reform poses for growing the labor movement and building greater progressive worker power. Speakers described the current efforts under way to plan for the legalization of millions of immigrants, focusing on national coordination of efforts to ensure services are provided to those who need them, and that workers are organized and empowered through strategic grassroots collaborations. The “Power Partnerships” session explored successful collaborations between labor and community groups to build community based worker power. Speakers shared stories from three campaigns: Multi-city carwash organizing, municipal Paid Sick Days campaigns and the AFT’s transformational partnerships with community. The AFL-CIO has been a strong partner and driving force pushing for federal immigration reform and is now seeking ways to partner with “Alt-labor” organizations. 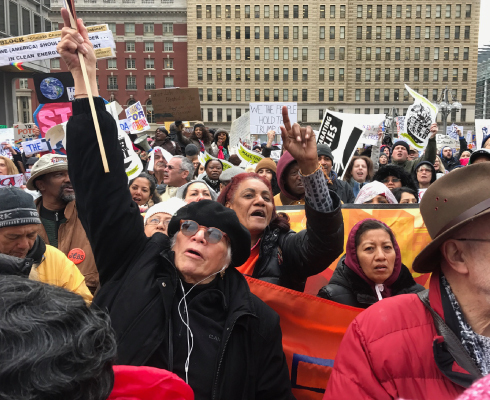 A host of CPD partner organizations were invited, including: the National Domestic Workers Alliance, Workers Defense Project, the Vermont Workers Center, Make the Road New York, the LA, NY and Chicago carwash campaigns, and Family Values at Work, among many others. The convention left us energized and excited to continue the work of further deepening the many important relationships between the AFL-CIO, union locals and internationals, and our community based partners.